From gloomy times in the 1980s, the American labor movement has returned to apparent prominence through the efforts of a new generation of energetic and progressive leaders. A distinguished group of authors examines this resurgence and the potential of American unions with sympathetic yet critical eyes. Experts from a wide variety of disciplines-industrial relations, political science, economics, and sociology-identify the central developments, analyze the strengths and weaknesses of the new initiatives, and assess the progress made and the prospects for the future. Though all agree on the importance of unions, their opinions of the success of current renewal efforts diverge greatly. The interdisciplinary and comparative approach of Rekindling the Movement is both challenging and enlightening. Rather than merely trumpeting pet opinions, contributors provide hard evidence and causal analysis, grounded in realistic perspectives, to back up suggestions for the improvement of the new labor movement. Their straightforward observations about what is and is not possible, what does and does not work, will be of great practical value for policymakers and union leaders. "Anyone concerned about the state of the American labour movement is likely to find reason for both hope and despair in this volume.... The editors of Rekindling the Movement have captured both tendencies in a comprehensive selection of articles, and consequently they present a mixed but probably fair reading of US labour's current prospects.... Rekindling the Movement will undoubtedly be an important and useful tool for organizers and those who study them. It should help rekindle the imagination as well." "The writers included in Rekindling the Movement expound on the newer strategies Lichtenstein favors.... 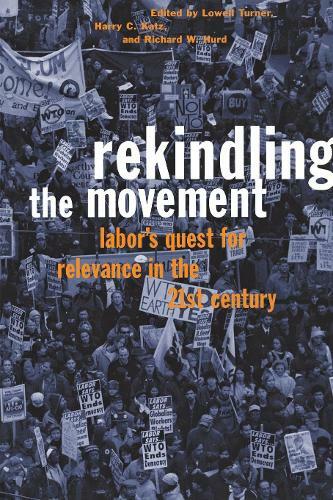 There's much that Lichtenstein and the authors of Rekindling the Movement discuss that provides hope." "This is a brilliant follow-up to the 1998 anthology, Organizing to Win... With essays by writers from diverse disciplines, this book is essential for both labor and business leaders who are challenged to understand and accommodate the needs of a rapidly changing and diverse workforce."